To take part in our wedding celebration my friend Azrina came to visit us from Malaysia. Since she only had one week in Southern California, Louis and I wanted to show her the the real socal. 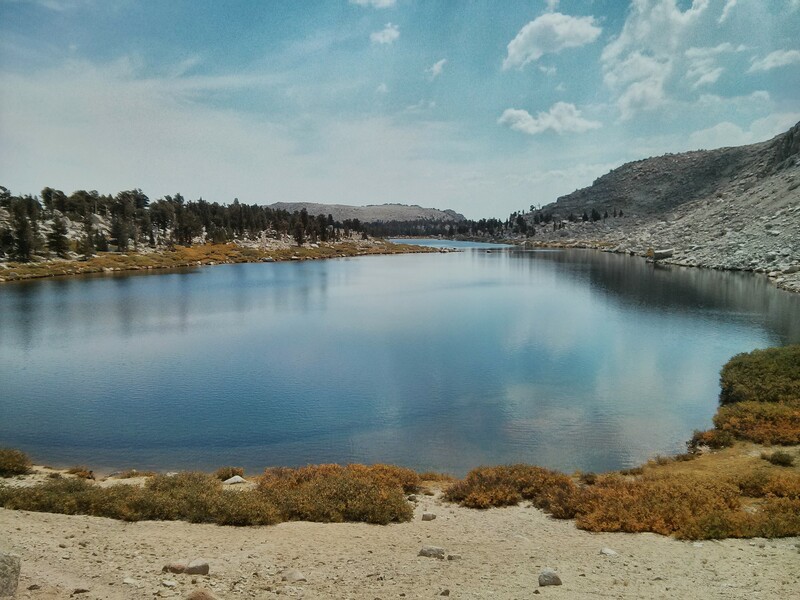 Shortly after the wedding, we set off on a 3 day backpacking trip to Cottonwood lakes in the John Muir Wilderness. 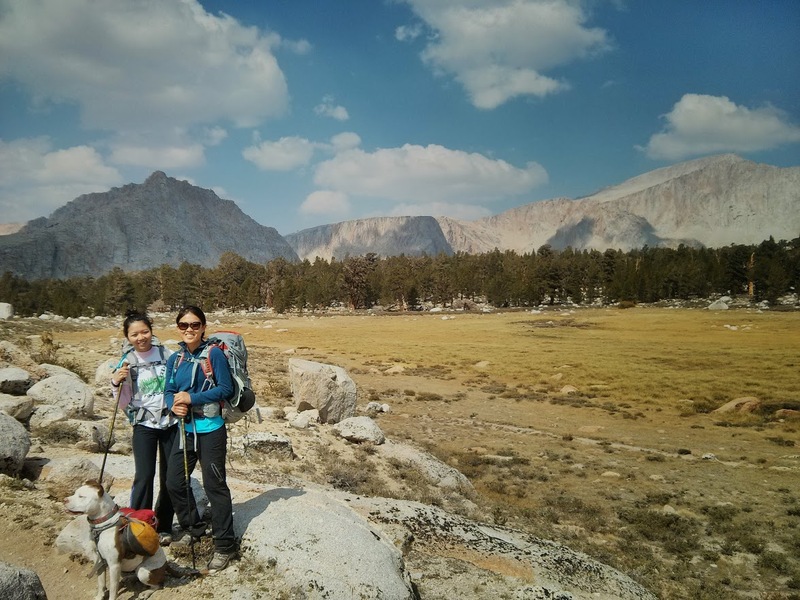 The trail head is close to the trail head to Mt Whitney. 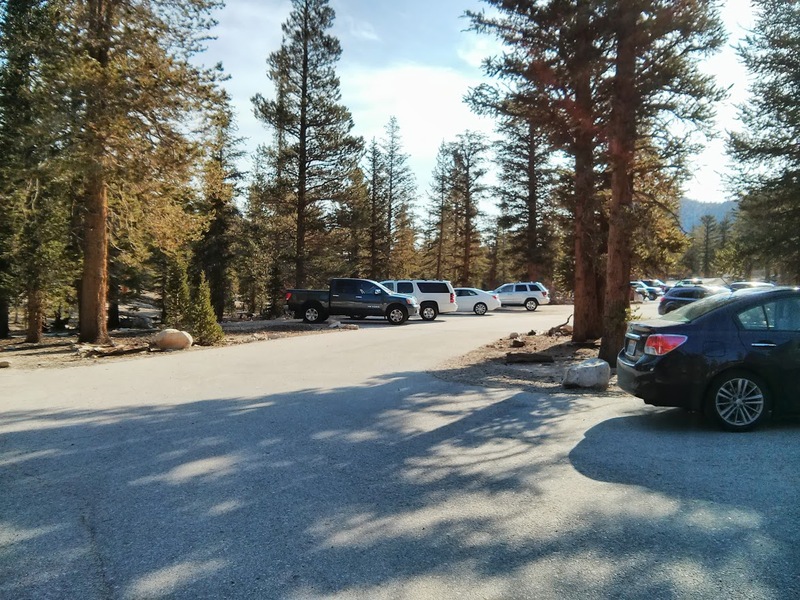 Since we arrived after 5PM, we made prior arrangement with the park rangers to pickup our overnight permit at the late night pickup box outside Lone Pine. From Whitney Portal Road turn-off, the drive up to the trail head is approximately 30 minutes. We camped at the trail head the first night. The weather was much colder than expected and poor Azrina spent the entire first night nearly frozen to death, this weather was pretty different than the humid tropical weather she’s used to! 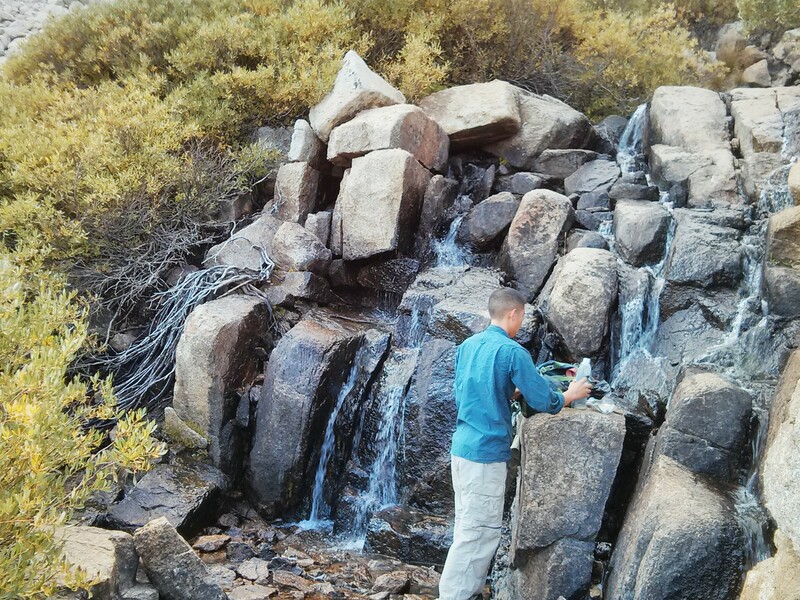 We set off to the Cottonwood lakes early next morning. Since it was a week day, we had this popular trail almost all to ourselves. The morning air was cool and crisp which made hiking very pleasant. The walk was beautiful, we were rewarded with alpine forests with meadows and streams. Leaves around the alpine forests were starting to turn yellow, it’s days like this that makes me appreciate living in Southern California. Unfortunately, due to the mislabeled map we printed out, we made the wrong turn at the junction of the Cottonwood Lakes and New Army Pass. Instead of going left towards New Army Pass, we turned right towards the Cottonwood Lakes. We did not realize our mistake until we reached the third lake and found a couple of hikers coming down from the ridge. Since this was further than what we originally planned to hike, we pitched our tents near the lake. While Azrina napped inside the tent, Louis and I found a good spot for refilling our water. 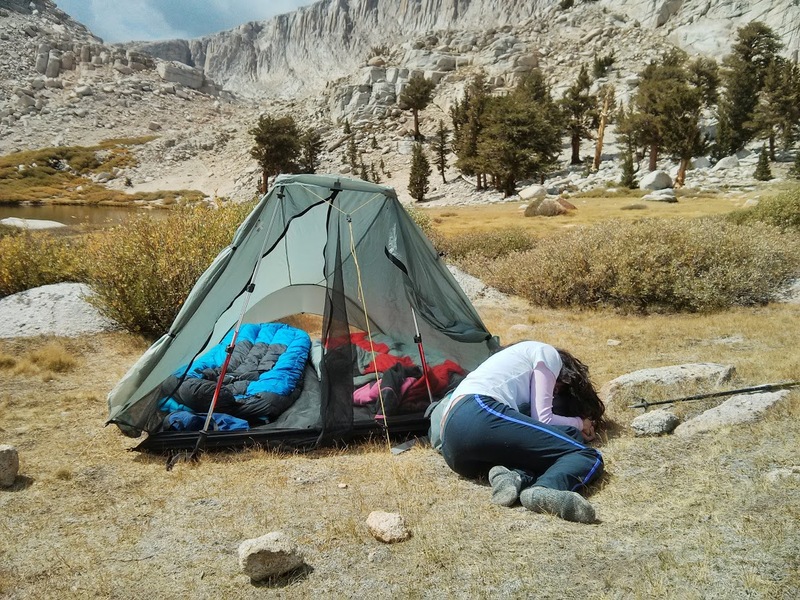 Shortly after we returned from filling up our water, we saw Azrina stumbling out of the tent. No one took her seriously when she crawled out of the tent, I actually thought she was joking and took a photo of her, see below. Needless to say, I felt pretty terrible when I finally realized something was seriously wrong. Azrina began to mumble out her symptoms, she was feeling nauseous, on the verge of throwing up and having cold sweats. On top of that, she could not move her limbs and was completely limp. Even though the weather that day was mild outside, the direct sunlight in the middle of the day made inside of the tent feel like an oven. The elevation at the third lake is around 11,000 feet asl, we knew she was either suffering from altitude sickness or heat stress. Not wanting to take a chance, we made her a cup of tea and decided to pack up and head down the mountain. Luckily, 20 minutes later, Azrina was feeling much better and was capable of walking again. We divided her the contents inside her pack into ours and headed out at 2:30PM. Luckily, Azrina was able to walk back the entire way without falling ill. We arrived at the trail head around 5:45PM with plenty of daylight and drove home. Overall, we learned a lot from this trip. We’ve never had a friend/fellow hiker fall ill during one of our hikes and are so thankful Azrina was okay after the trip. The Cottonwood Lakes area is beautiful, we plan to go back again to climb Langley and Cirque Peak. This entry was posted in Trail Reports and tagged backpacking, Hiking, John Muir, outdoors, trails, Travel by hikenoworklater. Bookmark the permalink.